Pease Park Picnic – say that 3 times fast. Yeah, kind of a mouthful. Today was all about a leisurely ride through the tree-lined streets of west central Austin. 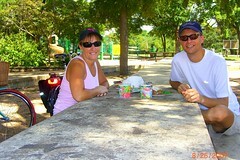 We eventually landed for a quiet little picnic in Pease Park. Wasn’t really up for an all out workout today but it felt great to get the fat tire bikes out and take our time. It was also the only reasonable way we could manage to haul around our picnic fare. We managed to bump into DK enroute, just walking down the street. Of course, we were riding down his street at the time so perhaps it’s not all that surprising. He was off to his usual haunt, Caffe’ Medici. I think he moved into the neighborhood just so he was closer to his favorite coffeeshop.